The historical novel THE PILLOW BOOK OF THE FLOWER SAMURAI tells the story of a Japanese peasant girl who becomes a samurai, and her skills and honor inspire a new code of ethics for all samurai. Read more about my book and an excerpt. 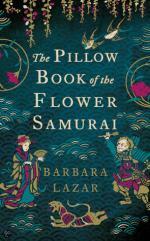 You can order THE PILLOW BOOK OF THE FLOWER SAMURAI at Amazon and Barnes & Noble.